Emily Carr (1871–1945), Yan, Q.C.I. 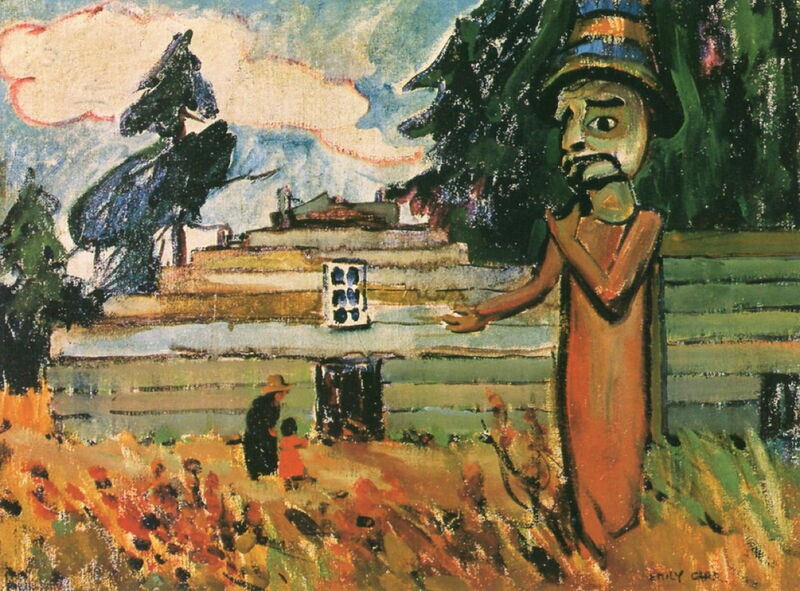 (1912), oil on canvas, 99.5 x 153 cm, Art Gallery of Hamilton, Hamilton, ON. The Athenaeum. 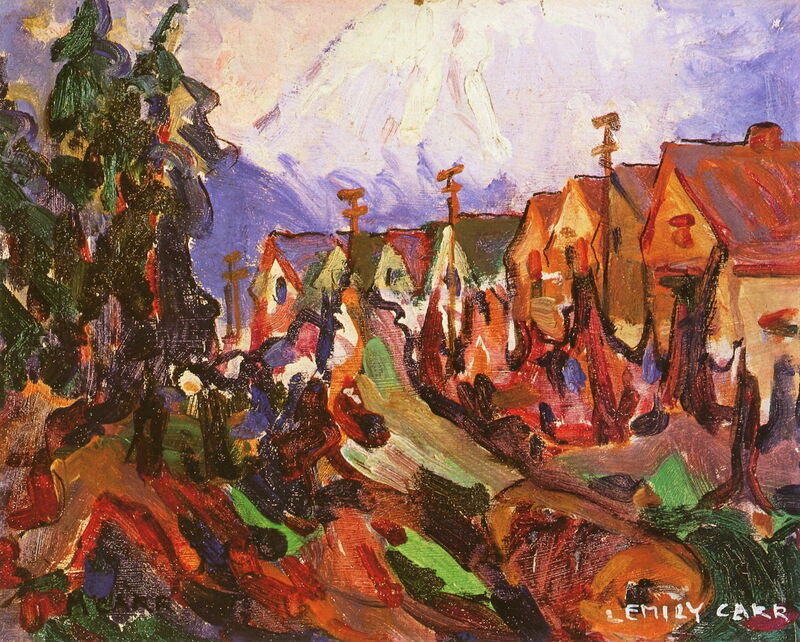 When Emily Carr returned to Vancouver from Paris in 1912, she first established herself there as a Fauvist when she exhibited her work from France in her studio. Equipped with what she had learned over the last 22 years in California, Canada, and Europe, she then set out on her project to document the indigenous peoples of the north-west coast. In the summer of 1912, Carr travelled north to Haida Gwaii (formerly Queen Charlotte Islands), the Upper Skeena River, and Moresby Island. There, she documented the totems and buildings of the Haida, Gitxsan, and Tsimshian peoples. She returned to Vancouver to teach and work, then travelled north again when she could afford to. Emily Carr (1871–1945), Cumshewa (1912), watercolour with graphite and gouache on hardboard, 55.8 x 75.4 cm, Private collection. The Athenaeum. 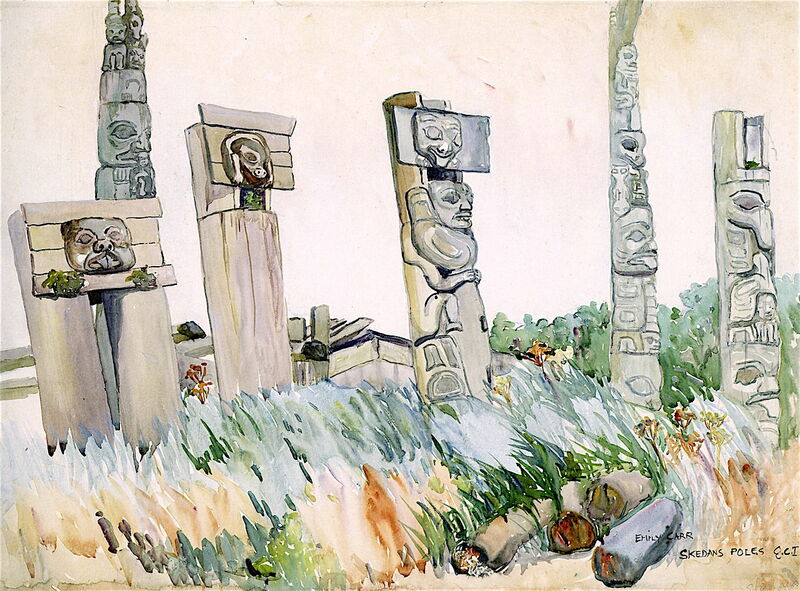 Cumshewa (1912) is a watercolour showing totems and part of the Haida settlement of Cumshewa, in the Haida Gwaii archipelago off the coast of British Columbia. It was a centre of the maritime fur trade until the early nineteenth century, and named in commemoration of an important Haida chief during the period of that trade. Carr remarked on its incessantly damp climate. Emily Carr (1871–1945), Potlatch Figure (Mimquimlees) (1912), oil on canvas, 46 x 60.3 cm, National Gallery of Canada / Musée des beaux-arts du Canada, Ottawa, ON. The Athenaeum. Potlatch Figure (Mimquimlees) (1912) shows a figure which had been involved in gift-giving practices which had been banned by the Canadian government, until they were decriminalised after the Second World War. Potlatches were held as rites of passage, on the occasion of births, deaths, weddings, etc., and typically more frequently during the winter period. A feast was held, attended by a kin group, and hosted by the richer people. This was accompanied by the exchange of gifts, which distribution and sometimes destruction of property was an important part of the dynamic – and the feature which the government was concerned about. Emily Carr (1871–1945), Skedans Poles, Queen Charlotte Islands (1912), watercolour on paper, 55.9 x 76.5 cm, Royal BC Museum, Victoria, BC. The Athenaeum. Skedans Poles, Queen Charlotte Islands (1912) is a watercolour showing a remarkable array of totems at this Haida village in Haida Gwaii. It is now part of the Gwaii Haanas National Park Reserve and Haida Heritage Site, and in its own right a National Historic Site of Canada. Emily Carr (1871–1945), Skidegate (1912), oil on board, 65.4 x 32.5 cm, Vancouver Art Gallery, Vancouver, BC. The Athenaeum. Skidegate (1912) shows a single totem in another Haida community in Haida Gwaii. Emily Carr (1871–1945), Tanoo (1912), watercolour, 74.5 x 52.2 cm, McMichael Canadian Art Collection, Kleinburg, ON. The Athenaeum. 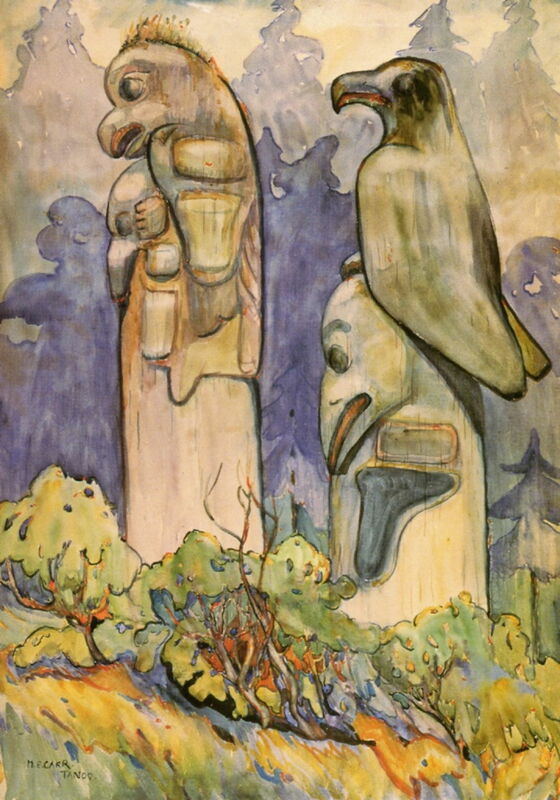 Tanoo (1912) is a watercolour of two totems at another Haida site in the Haida Gwaii archipelago, near Cumshewa. 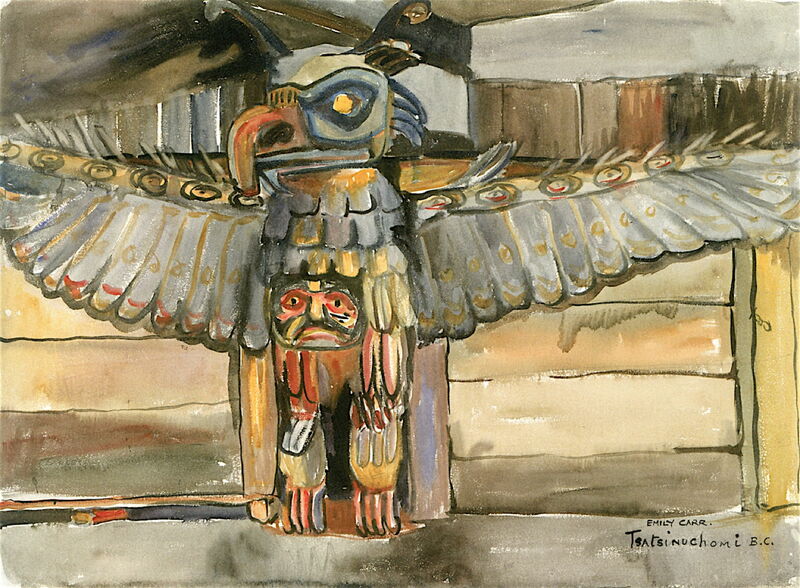 Emily Carr (1871–1945), Tsatsisnukomi, B.C. 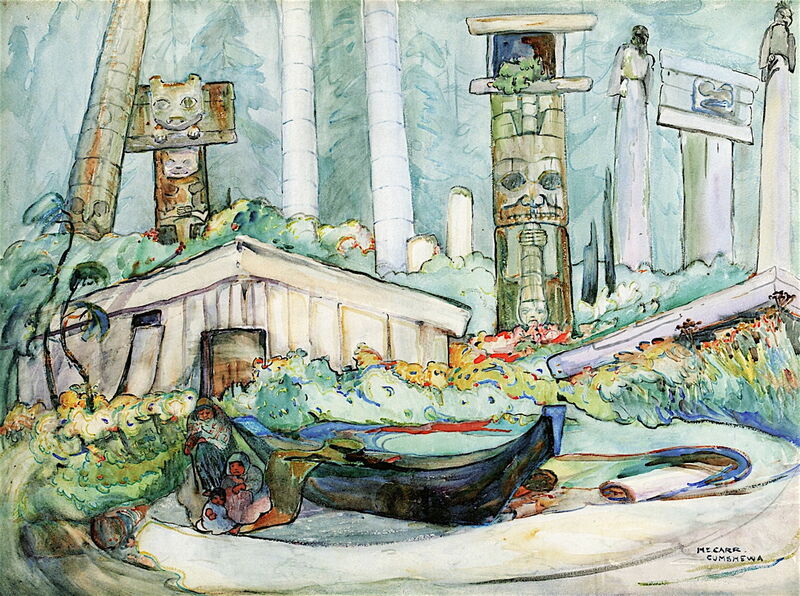 (1912), watercolour and graphite on paper, 55.2 x 75.6 cm, Vancouver Art Gallery, Vancouver, BC. The Athenaeum. Carr’s watercolour of Tsatsisnukomi, B.C. (1912) was, I believe, painted on the British Columbia mainland near Johnstone Strait, to the north of Vancouver Island, in which case it shows totems of the Tlowitsis Nation of the Kwakwaka’wakw peoples. 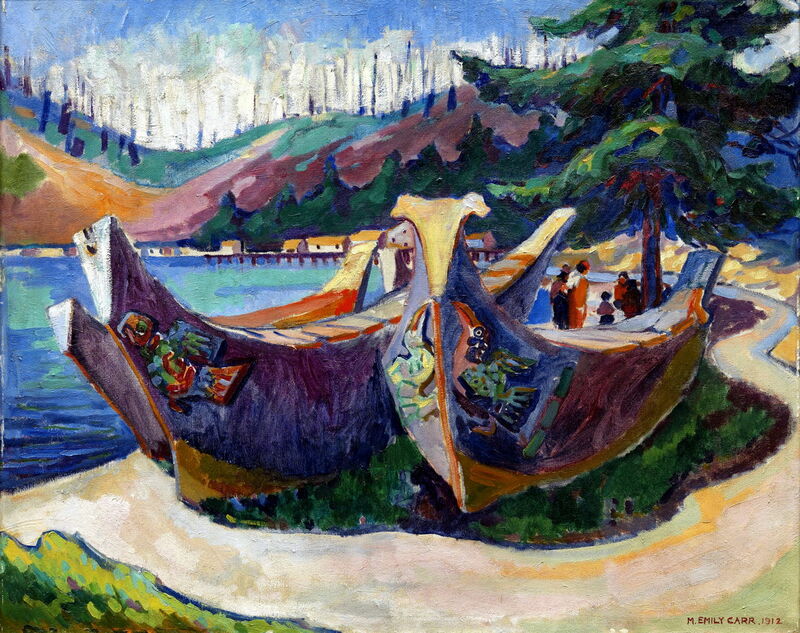 Emily Carr (1871–1945), First Nations War Canoes in Alert Bay, 1912 (1912), further details not known. Wikimedia Commons. First Nations War Canoes in Alert Bay, 1912 (1912) shows three large canoes in this Kwakwaka’wakw village on Cormorant Island, which is just off the north coast of Vancouver Island. Unusually for Carr’s paintings, it includes a small group of figures, who are talking together under the prominent tree behind the canoes. As far as I can tell, this is a finished oil version derived from a watercolour painting which is considerably less Fauvist in style. Yan, Q.C.I. (1912) must be one of Carr’s finest paintings of this campaign in the north of British Columbia. It shows an arc composed of numerous totems in this bay in Haida Gwaii, during the summer with the flowers in full bloom. The colours are vibrant but not garish or dazzling, and her brushwork develops a rich range of textures. Emily Carr (1871–1945), Indian House Interior with Totems (1913), oil on canvas, 89.5 x 130.5 cm, Vancouver Art Gallery, Vancouver, BC. The Athenaeum. 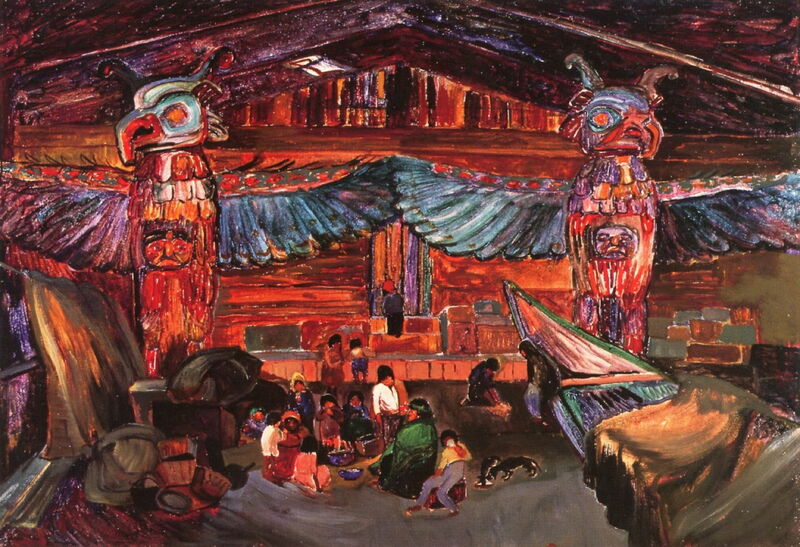 Indian House Interior with Totems (1913) is another superb painting, showing the interior of a large house with its brightly-painted totems, complete with a kin group, pets, and possessions. Emily Carr (1871–1945), Vancouver Street (1912-13), oil on card, 18.4 x 22.9 cm, Private collection. The Athenaeum. She also painted some views of the south, including this strongly Fauvist Vancouver Street (1912-13), a marked contrast from her more rigorously documentary depictions of totems and villages in the north. 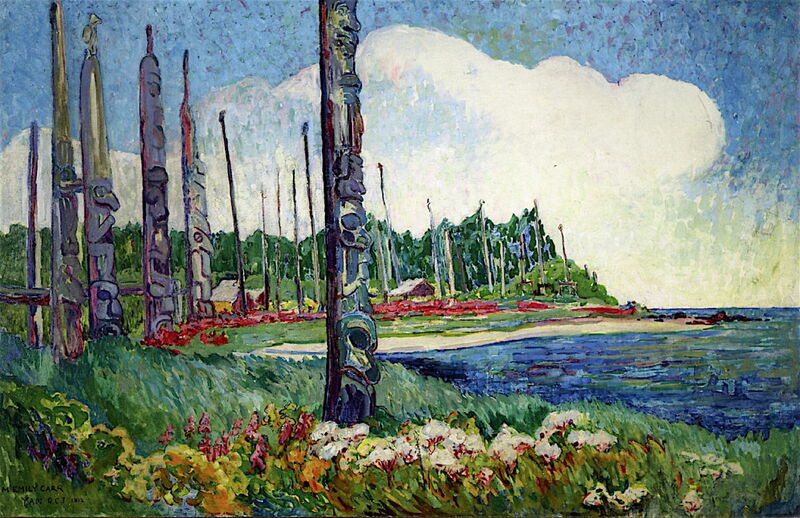 In 1913, Carr organised an exhibition of two hundred of her paintings from her travels to the north, the largest solo exhibition mounted by an artist in Vancouver at that time. Reaction to her paintings and a lecture she gave on them was mixed: when she offered her paintings to the new provincial museum, they were refused, and the minister of education failed to offer any support. Carr decided to return to Victoria, where some of her sisters still lived. For the next thirteen years, she concentrated her attention on running a boarding house on Simcoe Street, and painted infrequently. Posted in General, Painting and tagged Canada, Carr, Fauvism, landscape, painting, Post-impressionism, totem, trees, women in art. Bookmark the permalink.